Ever since I started weaning Amelia when she turned 6 months old, I have been looking for a container which will keep her pureed and finger food secure and air free. I have tried many various types and I think we may have found the best one yet! We were sent the Vital Baby Weaning set to review which is for babies of 6 months+. The great thing about this set is that you can fill it up and take it out and not worry about any leakages. I filled it with some mash, gravy and carrots the other day for baby group and usually the pots we have used in the past have leaked so I have ended up buying pouches. However after using the Vital Baby weaning set I think I will be making more homemade foods again. Another day I chopped up some pears and had them in the container to go out for the day with a friend. I actually forgot about them in my bag until Amelia got fussy in the car ride home. The picture above shows how the pear looked after being in the container for over 8 hours! Usually I find fruit to loose their colour and start to dry up slightly with a brown colour to it however the pear looked exactly like it did when I cut it up that morning. I was very impressed! The great thing about this container is you can also freeze it too and is the perfect size to fit in any fridge or freezer if you are wanting to save room. I like the bit at the top where you can keep the spoon and found that it stayed there all day. 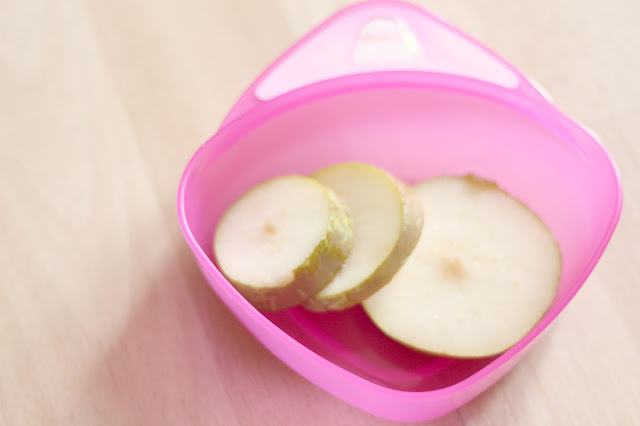 It is a hygienic cover so allowing you to keep the spoon clean instead of throwing it back in your changing bag. The bowl is really easy to hold and you can keep a good grip of it while feeding your baby. I found that it was really easy to spoon out the food and you don't miss a drop! The weaning set also comes in orange and blue and you can purchase this weaning set from Vital Baby for £3.99 which is a reasonable price seeing as a pack of 5 of their spoons cost £2.99 on their own. Overall I would recommend this set to any mum preparing to wean their babies and looking for a suitable container to store their baby food. I am very happy with this product and will be buying more of their products in the future.